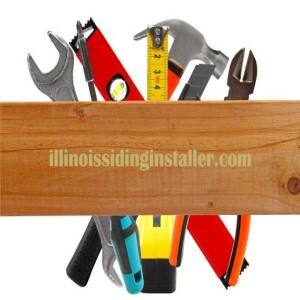 Just like with every home remodeling project, performing your new patio door installation in Chicago requires skills, knowledge, and a few basic tools. Do not attempt to remove your old sliding or French patio doors and replace them with a new set simply by assuming that you know how the whole installation procedure should be performed. If you’ve never replaced or assisted in patio doors replacement, keep reading for some important tips that can save you hours of frustration. This short guide will be most helpful in the first phase of your sliding or French doors replacement, doors that fit into the same size opening as the old set. The most important: the removal and installation process should be performed by at least two people, larger doors may require additional help to carry and position doors properly inside the opening. Safety goggles, work-gloves, sharp utility knife, crawl bar, hammer, power drill, metal blade equipped reciprocating saw very helpful), 6’ long level, measuring tape, square, exterior grade silicon / caulking, caulking gun, fiberglass insulation and / or low expansion foam insulation, wood shims, finishing nails, screws, vacuum. There are a few unknowns when it comes to installation of patio doors in an old opening and the only way to find answers to them will be to remove the old door. Start from protecting finished surfaces (floor, walls, and ceiling) around the work area. Removal process will vary, sometimes significantly, but the first basic steps are to remove sliding / swinging and stationary sections from the door frame. The next step is to remove interior and exterior sliding door casing / trim. In case you are planning to re-use the same casing / trim material for the new doors, extra caution will be required when removing and separating it from the door jamb (frame). First check if a layer of caulking or silicon has been applied along the trim and interior or exterior wall finish seams. If it has, use sharp utility knife to cut the sealant along the seam to separate trim and prevent wall finish damage. Make sure you cut the entire depth of the sealant and watch for any wiring (often phone, network, or TV cable) that could be attached to the trim. Once separated remove the trim with a pry bar – if you are saving the trim, remove it very slowly moving pry bar every few inches at a time / trim might be nailed and glued as well. The next step can be done in a couple of ways which mostly depends on available tools. If you happened to have a metal blade equipped reciprocating saw, use a pry bar to slightly separate each sliding door frame section from the door framing / door opening, and cut all nails or screws holding it in place. You can also remove all those fasteners using a hammer, pry bar, screw gun, or any combination of those tools. Once finished you should be able to push the old sliding door frame out of the opening. This is of course an ideal scenario, if your existing sliding door frame was equipped with nailing fin / flange (common for new construction doors), it might be more difficult and time consuming to get rid of it. Clean the opening from old insulation, remove all remaining screws and nails. Remove old caulking / sealant from where the threshold will sit and vacuum it. For the second phase – patio doors installation in Chicago – you need to carefully follow instructions provided by the manufacturer. Nobody likes to read them but they contain unique door installation details characteristic to that particular type of door you purchased. What’s even more important, failing to perform installation of your patio doors according to the instructions could void your warranty. Don’t feel like doing it on your own? Contact us for a FREE, non-obligatory patio doors installation in Chicago and surrounding suburbs.